So, I guess it’s time to come out and say it – Hello, I’m Rachel, and I’m a vegan. I promise I don’t just live off salad, and no, I haven’t yet died of malnutrition! 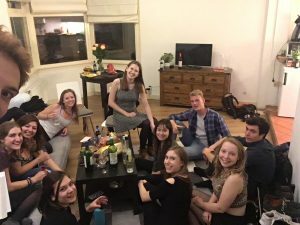 I’m starting a new blog series on how to survive as a broke vegan abroad, which will mainly focus on what kinds of things I eat and cook as well as some tips, stories and advice for anyone wanting to try out being vegan, or vegans who are wanting to study for a wonderful year here in the Netherlands! I hope you guys enjoy the series, and just let me know if there’s any topic you’d like me to talk about. Coming from the UK, where the number of vegans has skyrocketed in the past couple of years, veganism is a breeze. I can buy Morrison’s own cheap vegan ice cream just down the road, the whole city is full of incredible Asian restaurants that are super accommodating for us herbivores, and there’s even a market in town where you can buy 5 avocados for a pound (yes, I know, a pound!). The Netherlands, however, is not exactly known for its plant-based cuisine. 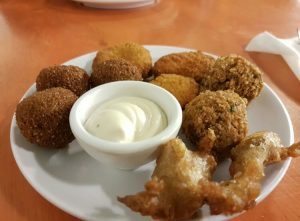 With cheese, fish and fried meat snacks such as bitterballen (don’t ask what’s inside them) being Dutch signature dishes, I was worried about how I was going to cope over here and how the Dutch would deal with my veganism. I needn’t have worried – after saying hello to everyone in my freshers group, we discovered that no fewer than five of us in a group of around 15 were vegan! Having vegan friends who were also new to the Netherlands really helped, as you don’t feel like such a freak saying you like vegetables. If you know others that are vegan too, you can help each other out with good spots to find vegan snacks and groceries, and of course they won’t grumble if you suggest going to a vegan restaurant for dinner. Luckily, the food we were given in the introduction week offered a vegan option, and much to my surprise, the Netherlands actually have a vegan dominoes option that we were treated to on the last day, something you can’t even get in the UK! Vegan Dutch fried snacks complete with mayo! I also was given a really useful tip from a friend who travels often – there is a great app you can download called Happy Cow. It is perfect if you’re travelling or moving somewhere for the first time, as you can search for vegan and vegetarian options wherever you are, and can filter prices, distance and type of cuisine easily. Using the app, I’ve found the most incredible fill-your-own falafel sandwiches for five euroes, and a Dutch snackbar that sells all kinds of vegan versions of Dutch food just five minutes away from where I live. Finding vegan groceries are also easier than I expected, as the first supermarket I walked into after flying over from the UK sold a vegan sausage roll that I had to snap up (albeit a rather pricey one). I’m loving experiencing the Netherlands as a vegan so far, and will be keeping you all updated on my herbivore adventures!